John Wesley was born on June 17/28, 1703 in Epworth, Lincolnshire, England. Rev. 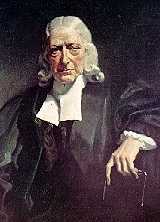 Samuel Wesley, his father, was the rector of St. Andrew's in the parish of Epworth from 1696 to 1735. He was the fifteenth child born to Samuel and wife Susannah. Only eight of his siblings survived infancy. His younger brother Charles was later born in 1708 and would become a prolific hymn writer. A year after Charles was born, the rectory at Epworth burned to the ground. John was trapped in his second story room. He ran to the window and the crowd below saw him. Knowing there wouldn't be time to fetch a ladder, one man stood on another's shoulders to reach John. Immediately after he was retrieved, the roof collapsed. John had narrowly escaped the blaze, later writing in his journal that he considered himself a "brand plucked from the burning" and felt that it meant he had a special calling for his life. John entered into studies at the Charterhouse School in London in 1714. Upon completion in 1720, he attended Christ Church College, Oxford. At the age of 22, his father urged him to go into the ministry in the Church of England. He graduated and the following year was ordained a deacon on September 19, 1725. The following year he was elected a Fellow of Lincoln College, Oxford. He remained a Fellow there for 25 years. After graduation, he was ordained a priest in the Church of England on September 22, 1728. Charles and John Wesley established a group that met regularly. They were called by various titles, such as the Holy Club, Bible Moths, and the Godly Club. Due to their methodical ways, they became known as the Methodists by 1732. They practiced daily meditation, fasted twice a week, and took the sacraments as often as possible. They also visited prisoners at nearby Oxford castle to preach, give communion, and deliver food and medicine. Wesley's room at Lincoln was restored in the early 1900s and is open for visitation by appointment. In 1735, John and Charles Wesley sailed to Georgia to work as missionaries. Georgia had only begun as a colony 2 years before in a project by James Oglethorpe. Things didn't turn out as they planned. They were thinking that they could bring Christ to the ignorant native population. Instead, the colony leadership had them serve only the settlers. Charles was assigned to Fort Frederica on St. Simons Island,. Instead of saving the native people, he was working as a secretary and preaching to difficult settlers. After only a few months, he returned to England. John spent most of his time in Savannah, but visited Frederica five times. John may have viewed his time in Georgia as a failure spiritually. But his experience while traveling stuck with him. He recalled how a group of Moravian Germans were calm despite the rough seas. Their peace caused him to think about his own inner peace. Upon their return, Charles and John joined a religious society in London. One day in May, 1783, Charles had a life-changing religious experience. Three days later, on May 24 while attending a service on Aldersgate Street, John had a religious epiphany. As he later wrote in his journal, "In the evening I went unwillingly to a society in Aldersgate Street, where one was reading Luther and preface to the Epistle to the Romans. About a quarter to nine, while he was describing the change which God works in the heart through faith in Christ, I felt my heart strangely warmed. I felt I did trust in Christ, Christ alone for salvation, and an assurance was given me that he had taken away my sins, even mine and saved me from the law of sin and death." The following year, John began preaching in places other than the pulpit (since more and more churches were refusing to allow him to preach). He traveled to Bristol to take over for George Whitefield (who was heading to Georgia). Following Whitefield's example, he began preaching outdoors to regular people. This was unusual for a priest in the Church of England. Normally, priest only delivered sermons according to the proper liturgy in a proper church. The Church also objected to Wesley's "enthusiasm." Within a few weeks, the number of people gathering to listen had increased so much that a meeting place was needed. So Wesley bought some land and built a meeting place. He called it "our new room in the Horsefair," and it became known as the New Room. It was used as a school and a dispensary when services weren't being held. It was remodeled in 1748 and is open for visitation today. The lower section of the pulpit is where he stood for leading worship and reading the Bible. He preached from the upper section, which was designed so that he could escape easily if attacked ... as was sometimes the case for Methodist preachers back then. As time passed, the numbers of Methodist followers increased and societies grew up around England. The first Methodist Conference was held in 1744. 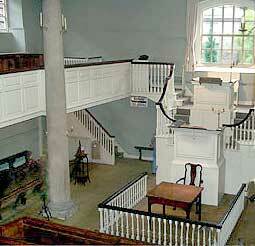 Wesley would preside over 18 such conferences at Bristol. Wesley's travels took him across Great Britain and even to other countries. Decade after decade he continued to visit and preach. 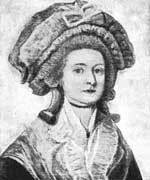 Wesley had "avoided" marriage with a couple of ladies in his college years and with Sophy Hopkey in Georgia. He was unsure if he should be married because he felt it would distract from his ministry. His relationship with Grace Murray, a Methodist convert, was ended when Charles made sure she married someone else; Charles was also afraid the ministry would suffer if his brother married. But a few years later, Wesley by-passed his brother and married widow Mary Vazeille in 1751. Although he made sure she understood that the marriage wasn't to keep him from his ministry, Mary found that she couldn't handle his itinerant lifestyle and was jealous. They separated years later and in 1771 she left him to move elsewhere. Wesley was a strong proponent of the social Gospel, and emphasized care for prisoners, the poor, the sick, and the uneducated. This began in his Oxford days and continued throughout his lifetime. He wrote some 400 publications in his lifetime ... mostly on religious subjects but also on other topics. Throughout his life, Wesley arose every morning before 5 am for Bible study and prayer. He often rode up to 20 miles and preached 4-5 sermons a day. Over his lifetime, he traveled over 250,000 miles and delivered over 42,000 sermons. He also had the foresight to make plans for the continuation of his work after he was gone. 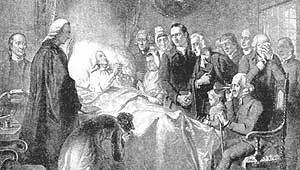 John Wesley passed away on March 2, 1791 in London. He was buried at City Road Chapel, London. Although he didn't want to break from the Church of England, the Methodist Church in England was formed after his death in 1791 and continued to grow. In the United States, Methodism was the largest Protestant denomination by the mid-1800s. Check out the links below for much more information on John Wesley. Also, here is a Powerpoint presentation on Wesley for you to use in your local church. John Wesley is born on June 17/28 in Epworth, Lincolnshire, England to Rev. Samuel Wesley and Susanna Wesley. John is rescued from a fire at Epworth Rectory on Feb. 9. He considered himself as "a brand plucked out of the burning." He begins his studies at the Charterhouse School in London. He had been nominated for the school by the Duke of Buckingham on May 12, 1711. He begins his studies at Christ Church as an undergraduate of Oxford. He receives his B.A. from Oxford in the summer. On April 5, he began a daily journal which he would continue throught his life. He is ordained deacon by the John Potter, Bishop of Oxford on Sept. 19. He is elected to a fellowship at Lincoln College, Oxford on March 25. He graduates on Feb. 14 with a master of arts. He is ordained a priest by Dr. Potter on Sept. 22. He joins the "Holy Club" established by his brother Charles and takes on a leadership role; he was the only ordained clergy at that time. On Nov. 22, he accepted a curacy near Oxford. On April 5, Samuel Wesley passes away. John and Charles depart for Georgia on Oct. 14. He is sent to minister to the colonists, but he views it as an opportunity to reach the native people ... much like Paul to the Gentiles. They arrive in Georgia on Feb. 6. He meets and falls for Sophie Hopkey, but he waits too long and loses her. He later experiences legal troubles and finally returns to England ... dejected because he wasn't able to convert the Native Americans as he had hoped. He departs for England on Dec. 22. He arrives back in England on Feb. 1. On May 1, he and Moravian Peter Bohler begin the Fetter Lane Society. His heart is "strangely warmed" at a service on Aldersgate Street on May 24. From June 13 to Sept. 16, he visited the Moravians in Germany. He joins George Whitefield in Bristol. On April 2, he follows Whitefield's example and starts preaching outdoors. On May 12, the cornerstone was laid for a meeting house. He first preached in the shell of the "New Room" on June 3. The first Methodist society in England is formed in Bristol. The first Methodist meeting house, the New Room, is completed. Riots started to break out against Methodists. People objected to Wesley's differences with the Church of England. The first Methodist Conference was held in June. He married Mary Vaizelle. His new wife isn't very accepting of his itinerant ways and they separate four years later. England is divided into 12 circuits. It is later further divided into 26 circuits in 1765 and 84 in 1780. Methodism now has 134,549 members. John Wesley dies on March 2. His final words are "Best of all God is with us".